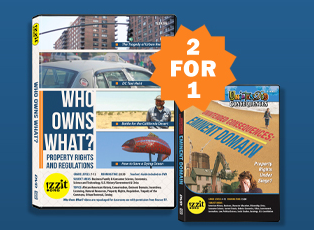 izzit.org News: New DVD - Another 2-for-1! Our 4th new DVD of the year, Who Owns What?, is now available on our website. Through November 30th, if you order Who Owns What?, you will also receive our popular DVD, Eminent Domain as a free bonus! If you've already ordered your free DVD for the year, consider signing up for izzitPLUS for only $9.95 per year and you can order a new DVD every 30 days after leaving feedback. That way you can get all our new releases (at least 4 more this school year! ).